Take a minute (literally takes a minute to complete) to make your opinion count in the name of traffic. Consider your daily routine. Consider your real estate property values. Consider the landscape in 10 years with exponential growth in St. Johns County. The Ponte Vedra / Palm Valley Citizens Traffic Task Force Board (CTTF), is now distributing the second phase of its traffic survey which covers the potential widening of A1A up to six lanes, Mickler Road, and 210 from the round-about to the ICW bridge. The CTTF will share a complete recap with the public once these surveys are compiled and summarized. 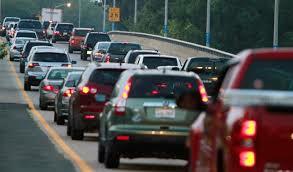 Below is the link to the second traffic survey. The survey will close on November 30th. The CTTF was formed by a group of volunteers comprised of members of various community and HOA organizations to look at the the overall traffic issue in the Ponte Vedra Beach area. Last Spring, a town hall meeting was held to discuss the findings, and the surveys grew out of that discussion. Here is a link to the complete study: CTTF Traffic Study.